As of 2015, the US population was 321,418,820; racially that breaks down to 61.6% White, 17.6% Latino or Hispanic, 13.8% African-American, 5.6% Asian, and 1.4% Native. The median household income is $53,482 and 14.8% of the population live in poverty. That’s one way of describing the pluribus, but falls far short of revealing the heartset. Pollsters ask questions and post percentages; rally-planners tape signs up and give out hats and bunch the crowd for media show; interviewers frequent coffee shops and barbecues asking the questions: What is most important to you in a leader? What is your vision for our country? Do you fear for your safety? How about your job? I think about the people I met on the Journey, fifty states-worth of living alongside them and learning about their lives; I didn’t see much anger, I did see some apathy, but mostly I saw pride; folks taking care of their community and living contentedly in their section of the bigger picture; I saw unum. Remember that post I wrote from Indianapolis? “It’s not what you’ve got that matters, it’s how much you love what you’ve got.” http://capitalcitiesusa.org/?p=9104 Imagine the excitement in the room as Ben and Thom and John were pondering the possibilities of a completely NEW country. So many people from so many places, now united as one! And Topsy grew and grew and grew. Now the US population represents far more countries than those six they drew on that shield; now there are more races, religions, languages and ancestries than they could have dreamed. 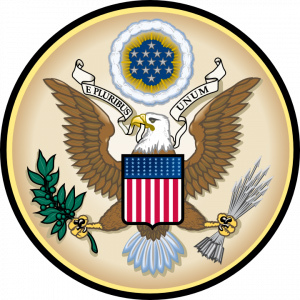 E Pluribus Unum has appeared on coins since 1795. E Pluribus Unum has graced the back of $1 notes since 1935. 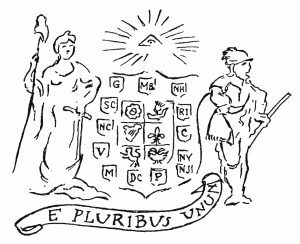 E Pluribus Unum is on the seal of the President, the Vice President, the United States Congress, the United States Supreme Court, and every branch of the United States military.